But popularity has paradoxes. Sometimes the most popular students are also widely disliked by their peers — even when those same peers seek to emulate them. And although we are hardwired to seek popularity, it isn’t always healthy for us, said Prinstein. In fact, one form of popularity puts teens at risk for long-term consequences. To make sense of these biological impulses and their social implications, Prinstein’s research focuses on two distinct types of popularity: likability and status. The type of popularity that brings back memories of the middle school pecking order is related to status. Status, said Prinstein, “is not a measure of how well a person is liked.” Rather, it reflects a person’s visibility, dominance and influence on the group. But there is another type of popularity that reflects a person’s likability. This is the first form of popularity that kids experience. “At the age of 3, you can go in and ask kids who they like most and least. The popular kids are the ones everyone likes the most,” said Prinstein. Again and again, children are drawn to peers who treat others with respect, who know how to share and cooperate, and who make other members of the group feel good about themselves. 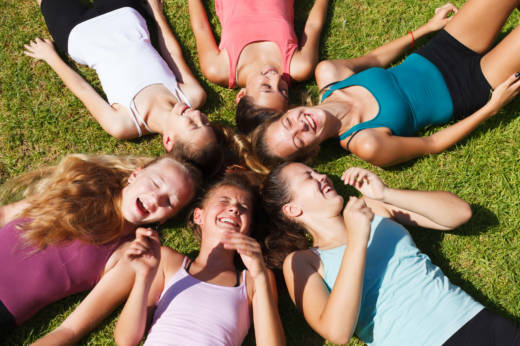 Prinstein notes that “the ability to interact with peers and remain emotionally regulated predicts addiction, dropout rates, relationships issues and even child-rearing ability.” Researchers have found that two groups of teens are most at risk for long-term consequences related to their social status. The first group is those who experience repeated rejection from peers. “We often interpret situations based on past, not current, experiences,” said Prinstein, so teens who experience rejection in high school come to “expect rejection” as adults, coloring their interactions with others and their self-perception. But high-status popularity also carries with it long-term risk factors. People whose popularity is grounded in status “grow up and believe that the way you get what you want is to be aggressive toward others and constantly attend to your social status,” repeating patterns that seemed to work in high school, said Prinstein. High-status teens are less likely to have satisfying friendships and romantic relationships later in life. They are also at higher risk for substance abuse problems, including DUIs. Prinstein’s research points to a few ways that adults can help students navigate these two types of popularity, giving teenagers valuable context for what is happening in their brains and in the hallways at school. For example, when assigning group work, teachers shouldn’t assume that teenagers have the skills to work together effectively, said Prinstein. Small groups are often a microcosm of larger social dynamics — and can be both powerful and potentially painful for participants. Teachers can prepare students for more effective group work by helping them identify and practice effective leadership skills. Prinstein’s research finds that “likable leaders lead differently than high-status leaders,” giving teachers an opportunity to explicitly promote the qualities of likable leaders. Evidence suggests that parents can effectively support their preschoolers’ social learning and likability through “scaffolding”: providing structure and modeling of positive social behavior and then stepping back as they grow more capable. In middle and high school, parents can still provide valuable social support, said Prinstein. Instead of “How do I share my toys?” the question might be “How do I turn down an invitation gracefully?” or “How do I express my feelings to a friend who has hurt me?” According to one study, when parents talked with their children about social skills — including what to look for in a friend or how to interact positively with others — they developed stronger peer relationships.